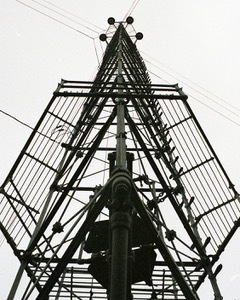 The mysterious aura of the moonlight tower stems from its beginnings in Austin history in 1894. The city chose to erect 31 towers in the late 19th century due to safety concerns and due to their efficiency in coverage compared to the then-new street lighting offerings. Austin is the only remaining city with these beacons of the past, and 15 towers still shine their intrigue across the inner-city streets. I have long had a deep appreciation for the history, utilitarian architecture, and complex geometry that make up these city landmarks, and I was thrilled to have an opportunity to capture its contrast against a grey November sky. My name is Mike Bayer, and I am a photographer living in Austin. I have been shooting for about 3-4 years, and enjoy everything from landscapes to portraiture to street photography. I have more recently become interested and involved in 35mm film due to its unmistakable aesthetic. I am also a lead guitar player and vocalist in my blues band, Victory Over Me, and a home brewer of all things beer. I’m very excited to be involved in this exhibition!